As we walk toward the end of route 2013, we are taking another stroll past our favorite animal posts from the year. Like a wonderful path that you enjoy walking with your dog each day, some things are made to be appreciated once, twice, and several times more. Dogs remember. They remember when they will be fed. They remember when their owners will return from work. They remember which pieces of furniture are off-limits — although, they may not care to remember this lesson when their owners are away. And they also remember how people treat them. Disrespect or neglect a dog, and that dog will shy away from you or become aggressive. On the flip side of that, treat a dog with respect and care, and he will show you his gratitude by giving you love and attention. The photo on the right adds more proof to this concept. Since we don’t want to steal the short write-up about this human and canine embrace, click the picture to read the article and see a larger version of the photo. Woof. 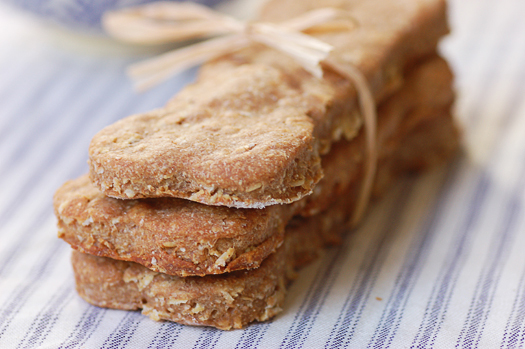 This recipe for homemade dog treats comes with a fun blog post. Love it! A husky playing in leaves. 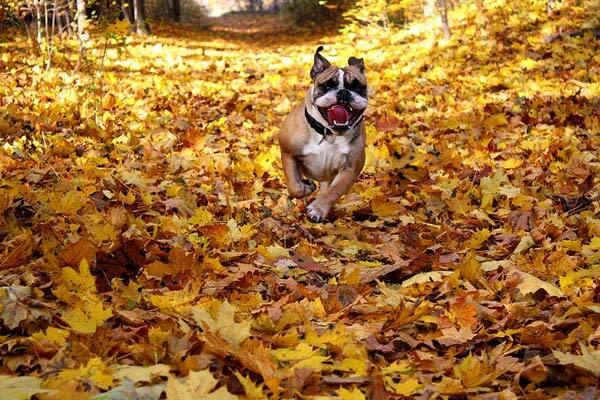 As if you needed another reason to love fall. Thank you for taking the last Weekly Walk of the year with us. We always appreciate your company, and we always want to hear your stories on the blog, Twitter, and Facebook. Woof! For the final Weekly Walk of the year, we are revisiting some of our favorite articles and photos from previous walks. This is repeat material if you have taken every walk with us, but like traipsing a familiar route through the woods, you might notice something you missed before. Whether we call our pets children, buddies, pals, or simply pets, if we care for them they become our family. This means we love and enjoy them when times are good, and we love them even more and worry about them when times are difficult. After Hurricane Sandy struck, many pets were separated from their families, but great strides have been taken to reunite them. Donations of money, food, and shelter have helped create happy endings for pets and owners, but more aid is always welcome to help counter the tragic endings. Click the photo to watch a TODAY video about pets and owners affected by the hurricane. Obie the dachshund weighs over seventy pounds [editor’s note: he’s below fifty-five pounds now!]. His previous owners were elderly and loved him with food, and eventually had to give him up. His new owner and he are on a mission to get him into proper wiener-dog shape. They’re calling the mission, “Biggest Loser, Doxie Edition.” Several online sites have posted about Obie, such as BuzzFeed, ABC News, and The Huffington Post, and you can watch a video of him on MSN’s TODAY. They would appreciate cheers and woofs on Facebook or support through donations. Monster: Use this command to teach your dog to check under the bed for creepy crawlies. We were dreaming of warm weather and beaches with chilled dog treats this week. Found a ball. In the leaves. Best. Day. Ever. Way back in April, we posted about Pedigree’s free software,Doggelgänger. The program uses your portrait to match you with a dog of your likeness. It also tells you where the dog is located for adoption. An automated voice guides you through the process, but you can silence it by clicking the barking dog icon in the upper right corner. The software can be a little buggy, so take your time. If you take a photo using the webcam, you need to hold still until the mapping outline turns green. If it worked, an option to begin finding your match will appear. This might help narrow your search for the perfect companion during National Adopt-a-Shelter-Dog Month. Enjoy the end of your year, and we hope to see you in 2013 for more Weekly Walks. Let us know your favorite posts from our blog on Twitter, Facebook, or here. Happy New Year and Woof!